One of the many marchers at the Justice For All March in Washington, D.C. In a sea of many, one man of faith emerges from a circle of comfort to fight alongside the hurting. 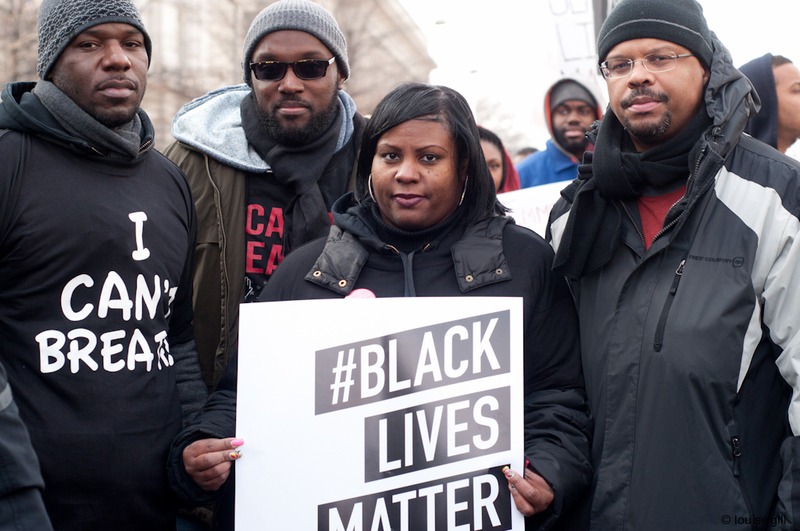 The “Justice for All” march, organized by Al Sharpton’s National Action Network, pushed for federal action to stop police brutality and racial profiling throughout the country. It was all prompted by the recent deaths of Eric Garner, who died as police in Staten Island, New York tried to arrest him for selling loose cigarettes, and Michael Brown, who was shot and killed by a police officer in Ferguson, Missouri along with grand juries in both cases declining to indict the white officers responsible for their deaths. The Washington D.C. march, of which I was a part was just one of many marches, demonstrations, die-ins throughout the country in major cities such as New York, Boston, Los Angeles and Oakland, under the slogan “National Day of Resistance” on Saturday December 13, 2014. In the days leading up to the march, I was unsure about the turnout. Nearly everyone I discussed it with expressed ignorance about the event. Those that were aware harbored serious doubts about the utility of marches. As a result, I had serious doubts as to whether there would be a significant turnout, but I was pleasantly surprised when I boarded the Metro(rail) and realized that it was only my church circle of friends that seemed to be unfamiliar about the march. Sensitizing and galvanizing was the exact effect of hearing from the families of Eric Garner, Michael Brown, Trayvon Martin and Tamir Rice. Tamir was the twelve year-old boy who was fatally shot in November by a rookie Cleveland police officer within two seconds of arriving to investigate a complaint about the boy carrying gun. The gun turned out to be a toy. Joining those families was Levar Jones, the man shot by a South Carolina state trooper in September when he reached for his license at the officer’s request. Kadiadou Diallo, mother of Amadou Diallo (an unarmed 23 year old man, who was gunned down in 1999 by four officers, all of whom were subsequently acquitted), offered a sobering reminder that this narrative has been repeatedly played out far too often in this country. The case of her son, gasping for breath in a chokehold, recorded for all to watch, took away the temptation to rationalize away the actions of the police, as some may have been tempted to do in the Brown case. Video of the Eric Gardner and Tamir Rice killings, alongside with the video of the shooting of Levar Jones, and against the backdrop of Trayvon Martin, has forced most to acknowledge, whether they want to or not, the gravity of the problem and the truth in the decades long complaints of the Black community. The grief, confusion, frustration, and anger toward law enforcement and its apparent lack of accountability that these families have felt, rumbles in people nationwide. Among those for whom this problem resonates, are people who purport to exercise faith whose narrative is focused on the ultimate triumph of truth and justice. Like the Civil Rights movement of the 1950’s and 60’s, Christians should be at the forefront of issues where injustice rears its head until “justice flows like water, and righteousness, like an unfailing stream.” After all, the Bible is replete with instructions on seeking justice and correcting oppression. • 1 John 3:17-18 “ But whoso hath this world’s good, and seeth his brother have need, and shutteth up his bowels of compassion from him, how dwelleth the love of God in him? Until the day that all things are made new, Christians have a moral duty to do something.